Tomorrow, February 2, is Groundhog Day. It is not necessarily a day of family gatherings, gift giving or big celebrations but it is a holiday that is worthy of being pre-printed on many calendars. 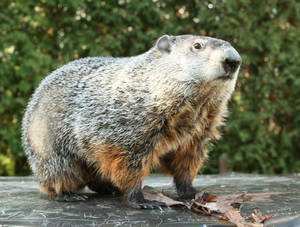 In Pennsylvania everyone waits & watches patiently to see if Punxsutawney Phil will see his shadow (or not)! Legend has it that if “Phil” sees his shadow there are six more weeks of winter. If Phil doesn’t see his shadow, spring will be here soon. 1. 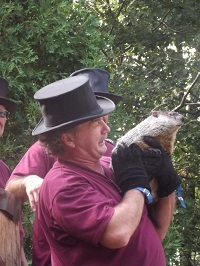 Groundhog Day has been celebrated in Punxsutawney since 1886. 2. Groundhog Day, always on February 2, is a popular tradition in the United States. The tradition is based on a legend that animals awaken from their hibernation on a specific date. In the past nature greatly influenced our lives so on February 2 the groundhog came out of his hole after a long winter sleep to look for his shadow. If he sees it, it is regarded as an omen of six more weeks of bad weather & will go back into his hole. On the other hand, if it is a cloudy day and he doesn’t see his shadow, he takes it as a sign of spring & stays above ground. 3. Another tradition is that Groundhog Day is based on is Candlemas Day. This was a custom with the early Christians in Europe that the clergy would bless candles and distribute them to the people. This day marked a milestone in winter and the weather that day was very important. 4. The Romans spread the tradition of Candlemas Day to the Germans. The Germans added to the tradition that if an animal, the hedgehog, saw his shadow on Candlemas Day then there would be six more weeks of bad weather (or a second “winter”). Many of Pennsylvania’s earliest settlers were Germans. They determined that the groundhog was a suitable substitute for the hedgehog and February 2 was selected as the day to celebrate! 5. On February 2, Phil comes out of his burrow on Gobbler’s Knob – in front of thousands of followers from all over the world – to predict the weather for the rest of winter. Did Phil see his shadow? Oh no – does this mean 6 more weeks of winter? 6. Punxsutawney Phil is named after King Phillip. 7. The average groundhog is 20 inches long and normally weighs from 12 to 15 pounds. Punxsutawney Phil weighs about 20 pounds and is 22 inches long. A groundhog eats lots of greens, fruits, vegetables and very little water. A groundhog can whistle when alarmed and whistles in the spring when they begin courting. Groundhogs are very clean animals. They are one of the few animals that really hibernate. They actually go into a deep coma where the body temperature drops to a few degrees above freezing, the heart barely beats, blood hardly flows and breathing nearly stops. A groundhog’s life span is about 6 to 8 years. Phil receives a drink of a magical punch every summer during the Annual Groundhog Picnic. This gives him seven more years of life. In 1981 he wore a yellow ribbon to support the American hostages in Iran. Phil traveled to Washington DC to meet President Ronald Reagan in 1986. 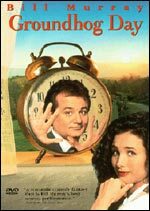 In 1993, Columbia Pictures released the move, Groundhog Day, starring Bill Murray. The movie Groundhog Day was released in 1993. Crowds as large as 30,000 visited Punxsutawney on Groundhog Day after the release of the movie. In 1995, Phil was on the Oprah Winfrey show. In 2001, Phil’s prediction was shown live on the JumboTron in Times Square, New York City. Also – Pennsylvania’s Governor, Ed Rendell, attended the ceremonies in Punxsutawney. He was the first Governor in office to do so. So – tomorrow is Groundhog Day. I hope you now have a better appreciation for this traditional, yet quirky, holiday. Take a few minutes to take note of Phil’s prediction for this winter. What do you think of his prediction? P.S. On a very unrelated topic – but important one this weekend – GO RAVENS!!!! I am so glad Phil was written about…I always wanted to know more about him ! !